Little packages of goodness! 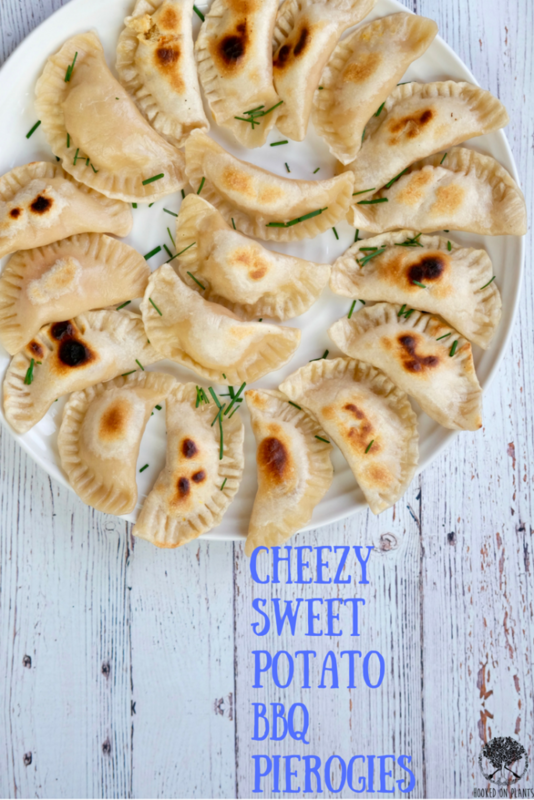 Yup, Cheesy Sweet Potato Pierogies in all their glory, and completely veganized. Top it all off with some Tofutti or cashew sour cream and caramelized onions to impress any fantastic Polish grandma in your life. 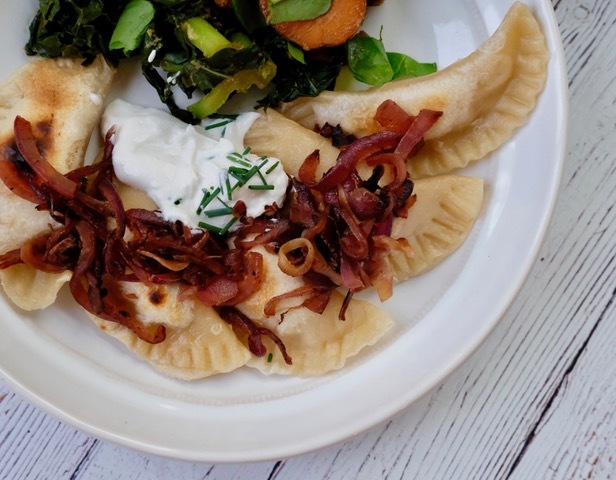 This recipe makes 40 incredibly satisfying pierogies (8 servings-worth), so you can boil & freeze them, and say goodbye to those last minute weeknight dinner freak outs in the near future. Hello there you chewy, comforting, tasty parcels of love. 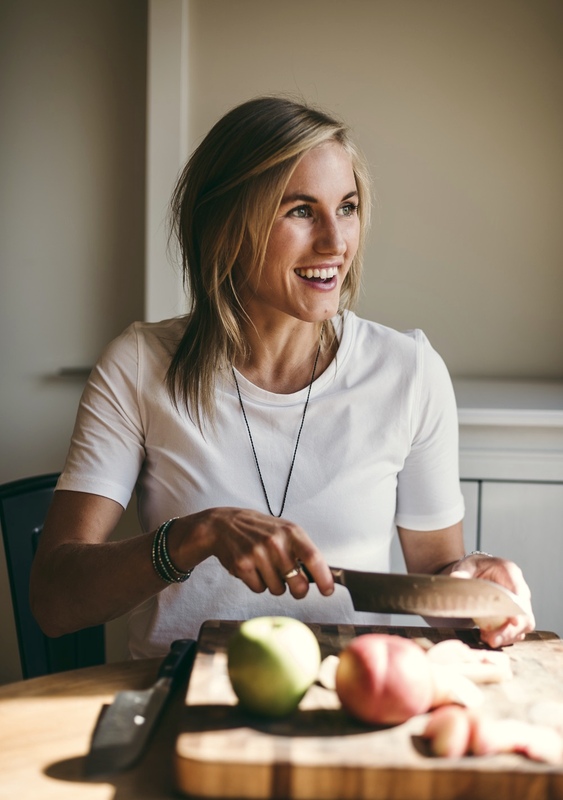 A comforting, flavourful favourite, veganized! Filled with sweet potatoes and cashew cheese, and topped off with caramelized onions and cashew sour cream. *Prep time doesn't include the overnight soaking time for the cashews! Make the dough: in your electric mixer, or a large bowl, stir together flour, salt and coconut oil. Then add in water a little bit at a time until a ball forms. If too dry, add more water, if too wet, add more flour. Knead the dough for 4 minutes on a floured countertop, then wrap it in sarran wrap and place it in the fridge for 30 minutes. Now it's time to make the two fillings. 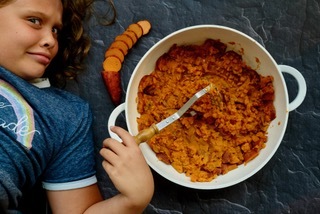 Make the sweet potato filling, steam the sweet potato for 8 minutes. 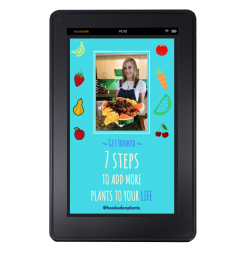 Transfer to a bowl, then mash in the rest of the filling ingredients until they're evenly distributed and the sweet potato is smooth. Make the cashew cheese, blend all cashew cheese ingredients together in your food processor until smooth. Roll out the dough on a large floured counter until it's 2-3mm thick. 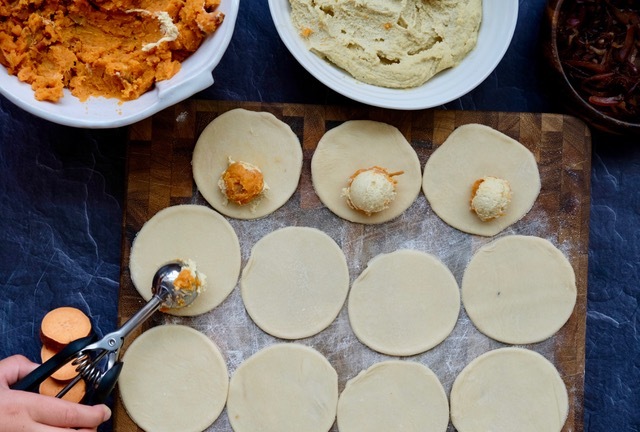 Using a mason jar lid, press as many circles in the dough as possible to create the pierogi circles. 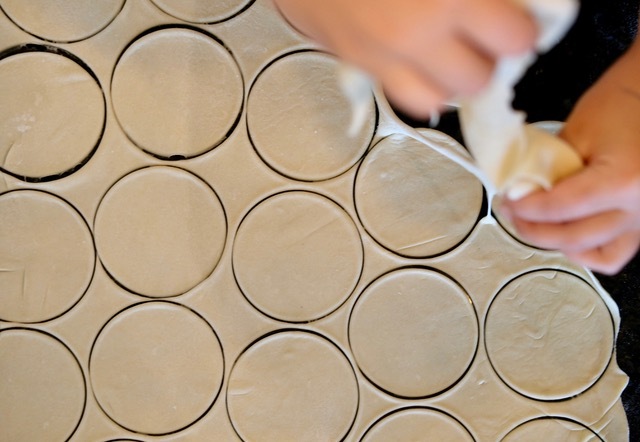 Pull up the in between extra dough, roll it out again and make more circles. Repeat until all dough is used up. Fill em' up! 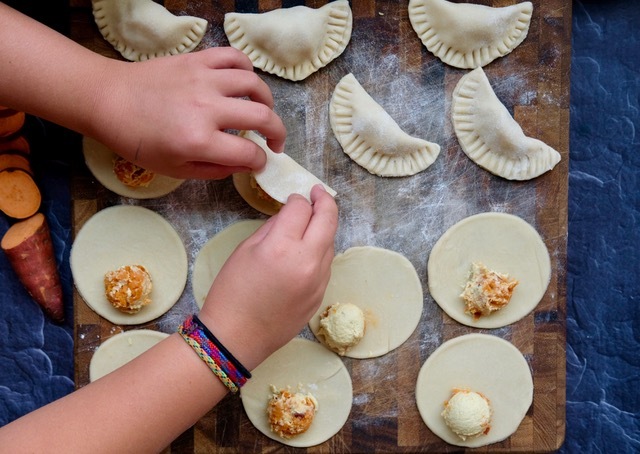 Use an ice cream scooper to place a ball with half sweet potato filling and half cheese filling onto each pierogi circle (just off center). Wet the edge of one half of the pierogi, and fold the other half over the filling to the wetted edge. 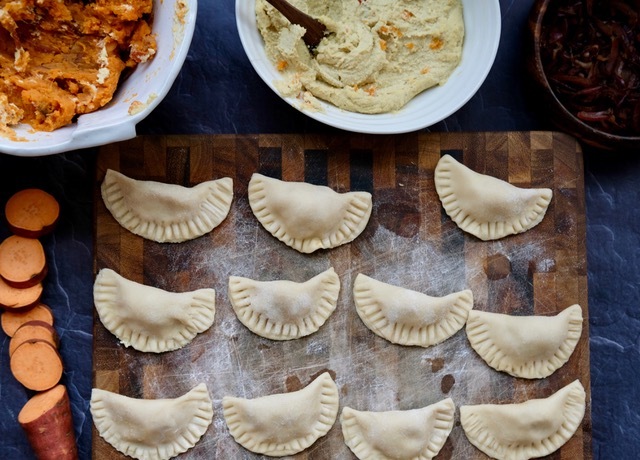 Press the edges together with a fork to form a half crescent pierogi shape. Bring a pot of water to a boil. Place about 10 pierogies in to the boiling water at a time (making sure they don't stick to the bottom) and let boil 7 minutes. Set aside in a strainer. Repeat until all are boiled. Meanwhile, sauté onions: heat a pan to medium heat, add onions, let cook for 2 minutes, deglaze with balsamic vinegar. Let sauté for 8 minutes, adding more balsamic if they're sticking. Option 1: BBQ! 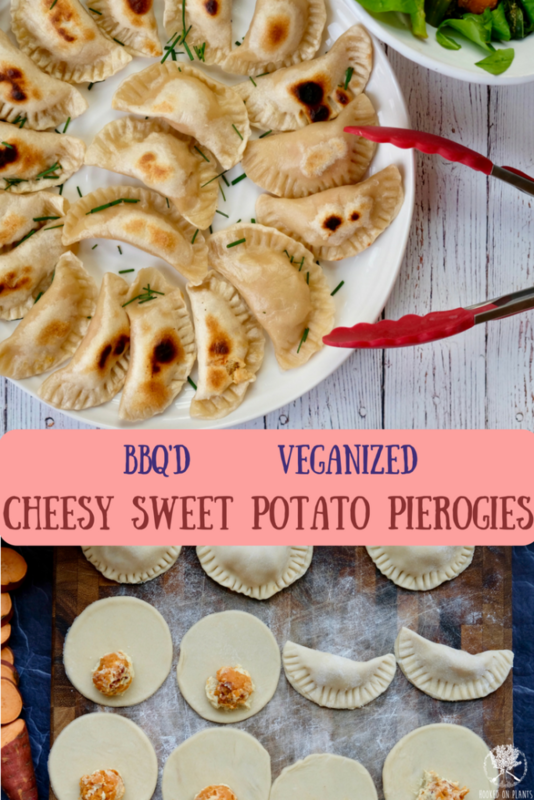 Set BBQ to 400° and bake pierogies on a cookie sheet with parchment or a reusable parchment sheet for 10 minutes, flipping once. Option 2: Fry! 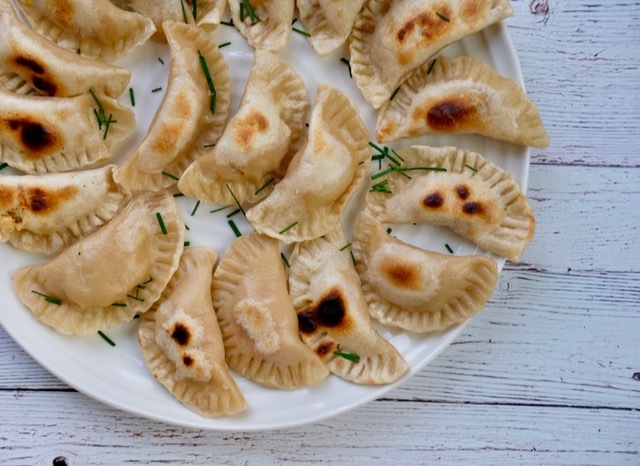 Bring a pan to medium heat, use a tsp of coconut oil, then place the pierogies into the pan for 3 minutes a side. Option 3: Freeze! 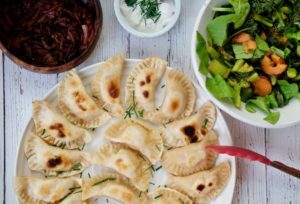 Let pierogies cool in a single layer on a baking sheet in the fridge or freezer. Then place in a reusable ziplock and freeze for up to 6 months (if you don't eat them before that). Serve them up with this Cashew Sour Cream, frech chives, and sautéed onions! With a side of greens (I steamed broccoli, and mixed it with tamari and nooch, YUM). 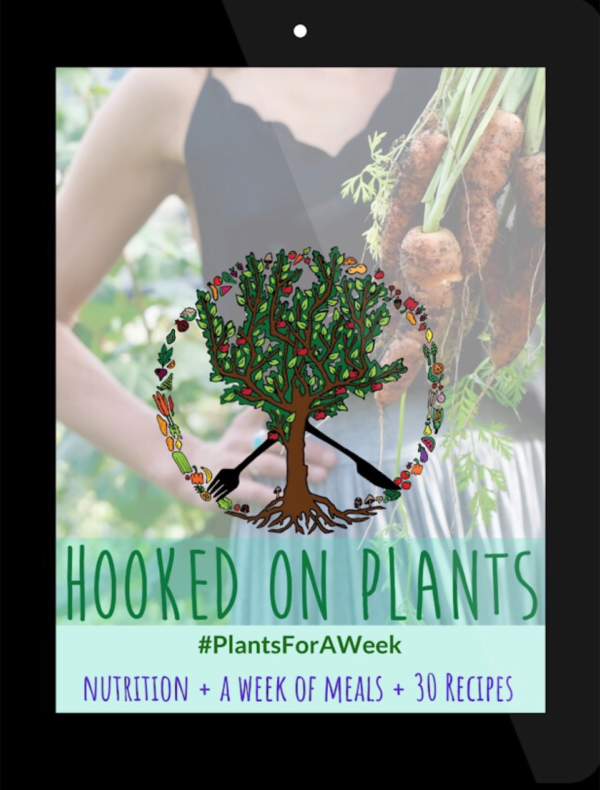 This week is all about the incredible innovators in the vegan seafood realm!